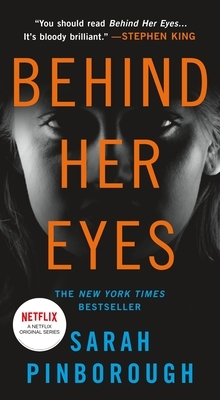 Behind Her Eyes is the masterful psychological thriller from Sarah Pinborough with the ending everyone is talking about - the story of a marriage like you've never imagined. Meet Louise. She is a hard-working single mom, stuck in a rut. One rare night out, she meets a man in a bar and the sparks fly. Though he leaves after they kiss, Louise is thrilled to have finally connected with someone. When she arrives at the office on Monday, Louise meets David, her new boss. It’s the man from the bar. The very married man from the bar who now says that their kiss was a terrible mistake…even if he still can’t keep his eyes off his new secretary. Then Louise meets Adele, who’s new in town and in need of a friend. She seems to be deathly scared of her husband. ..who happens to be David. How did Louise end up drawn into this couple’s orbit—and how will she ever find her way out? The only thing that Louise knows for sure is that something in David and Adele’s marriage is very, very wrong. But how could she have ever imagined just how far a husband and wife might go to protect their secrets?